This item features a drop-front drawer for easy access to media components. The drawer front opens downwards and pulls out, allowing you to keep a DVD player or cable box discreetly tucked away, while providing remote access to your device with the flip of a drawer. Cord management within the drawer ensures you can easily and safely connect your devices, increasing air circulation into the chest to prevent your devices from overheating and keeping messy wires out of sight. Aromatic cedar wood lines the bottom drawer(s) of this item, providing a smooth, snag-free surface that will protect your clothing. The durable wood resists damage from moisture, mold, and bug infestations, eliminating the need for harmful or smelly products such as moth balls to protect your clothing. A mark of quality furniture, cedar-lined drawers carry a distinctive and pleasant smell, and make a great home for off-season clothing. Organize and protect your jewelry with this item's included jewelry tray. The tray bottom is lined in felt, which works to keep items in place as you move the drawer, preventing tangles and scratches to both your jewelry and the drawer. If you need more drawer space or wish to take your jewelry into another room, simply remove the tray and place elsewhere. Create a tropical paradise in your bedroom with this beautiful eight drawer dresser. It is crafted with vibrant cherry veneers that pair beautifully with the padded raffia drawer fronts and bamboo-styled hardware, all of which contribute to the distinct tropical look. For storage you receive eight spacious drawers, including a pull-out drawer with drop-down front and a sliding 6-inch jewelry tray, while the two bottom drawers feature cedar-lining. 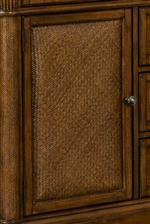 The Amalie Bay 8 Drawer Dresser with Padded Raffia Drawer Fronts by Broyhill Furniture at AHFA in the area. Product availability may vary. Contact us for the most current availability on this product. Give yourself the tropical paradise you've always wanted with this whole home collection of living, dining, and bedroom furniture. The collection is grounded by the use of quartered cherry veneers, while the rattan and raffia accents elevate the style to that tropical vibe. 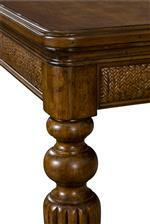 You'll also find traditional elements for a more formal, but not stuffy, look. 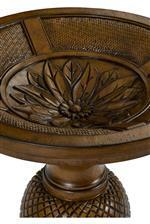 The Amalie Bay collection is a great option if you are looking for Traditional Tropical furniture in the area. 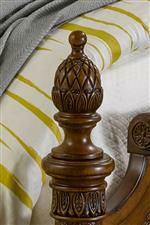 Browse other items in the Amalie Bay collection from AHFA in the area.